Remodeling a bathroom would require a lot of time and money. Yet, doing so is definitely worth it. 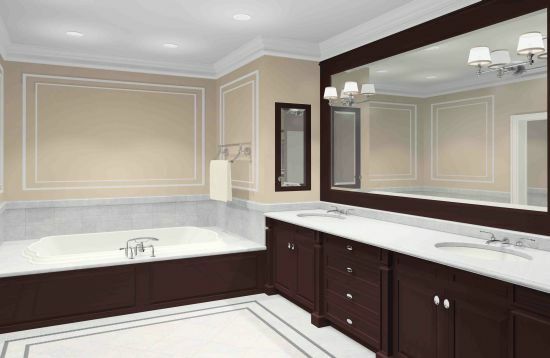 Your bathroom renovation will certainly have a big impact on the overall value of your home. But as you get ready to remodel your bathroom, consider lots of factors. Think of the size of your bathroom, the color, the theme, the furniture and fixtures and many more. If you want to infuse a modern vibe to your bathroom, then check out these 15 modern bathroom remodeling ideas that you can take inspiration from. 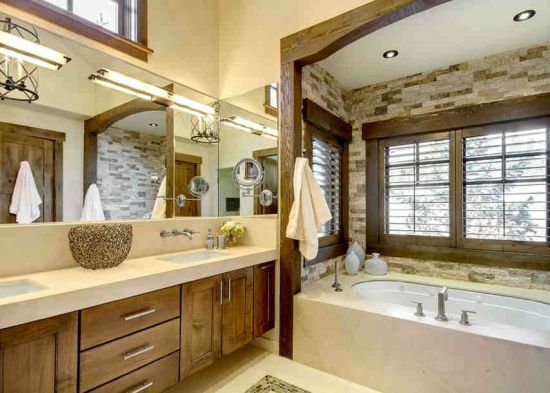 If your bathroom already features a rustic appeal and you want to make it look modernized, then go for the modern rustic appeal. 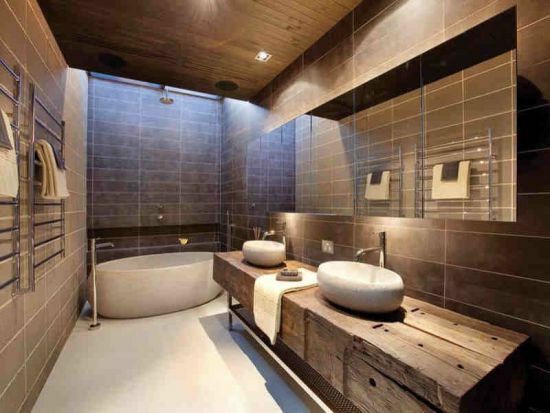 With this kind of bathroom remodeling idea, all you will do is to make use of as much wood as possible in order to create a pleasant ambiance and boast an artificial and natural light. In the picture shown below, the cabinets below the sink are made of wood and the window near the tub had some wooden accents on it, too. 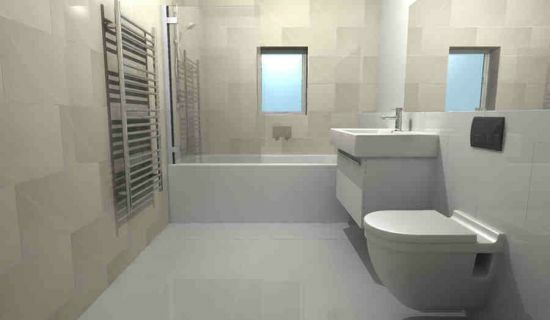 Modern bathrooms are often huge, airy and spacious. But if you have limited space for your bathroom remodeling, then the solution is to make use of huge mirrors. Installing a really huge mirror such as the one shown below can help to make your bathroom appear bigger, thus, giving it a contemporary look, without spending a lot. Of course, proper lighting is important as well and adding a monochromatic palette can help to balance the small area in your bathroom. Contemporary bathroom remodeling ideas would suggest having a spacious area in your bathroom. It induces a feeling of openness and comfort. So when it comes to remodeling your bathroom, make it as spacious as possible, especially if you have enough space to do so. Limit the walls and focus instead on installing huge mirrors. If possible, include a huge window that opens up to nature such as the one shown below. If you feel that your bathroom just looks boring, then why don’t you add a beautiful piece of furniture to spice up the look? 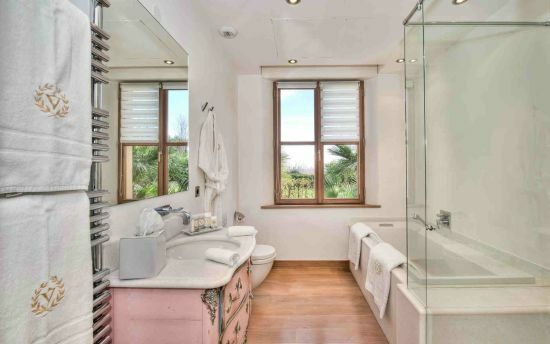 The dirty pink wooden cabinet with sink, as shown below, certainly adds color to a once boring bathroom. The furniture allows you to enjoy the warming power of wood and serenity through a combination of clean contemporary lines. 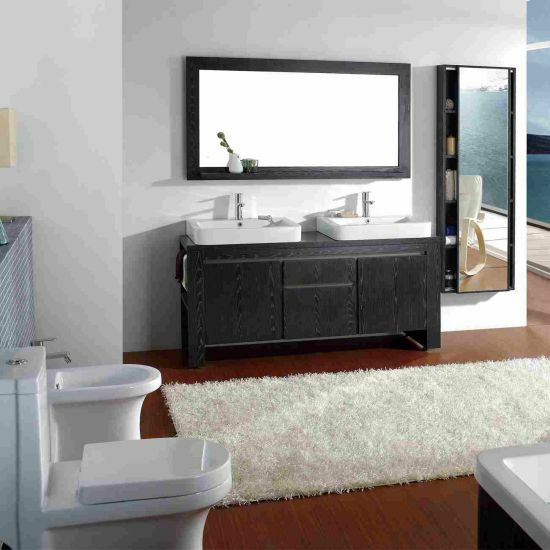 Indeed, this modern bathroom exudes a feeling of relaxation and comfort. 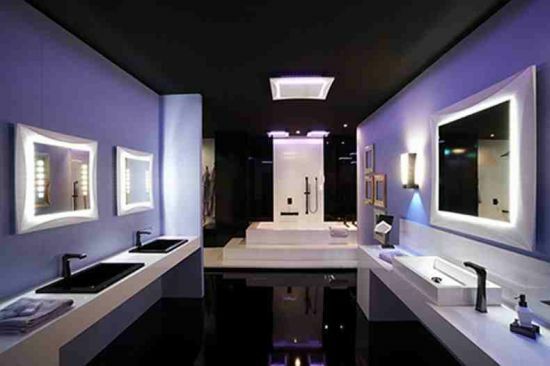 Installing LED lights is one of the best bathroom remodeling ideas that you can take inspiration from. By having LED lights installed in your bathroom, your bathroom will not only look modern and luxurious, but you will also be able to indulge in a warm and comfortable ambiance each time you take a bath. It’s definitely something to look forward to after a long tiring day. Wood and brown hues are a perfect combination for a modern rustic feel in your bathroom. Both elements offer an almost surreal comfort zone to your bathroom space. Adding a frameless mirror just like in the picture shown below helps to enhance its modern rustic feel. This bathroom remodel design features a monochromatic modern feel and is a perfect example of what a modern bathroom should be like. You sure know that bath tubs come in various sizes and shapes, although the most common of all is rectangular. If you want to infuse a modern vibe to your bathroom, then do not settle for the usual shapes. Go for the unique ones, such as this contemporary oval shaped bath tub. 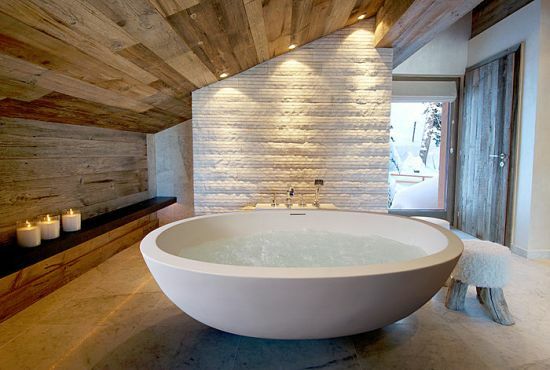 Soaking in this lovely tub will certainly relieve you of your day to day stresses. Modern bathroom often feature large tiles and light colors. Thus, if you are thinking of remodeling a bathroom and make it to look modern, consider replacing the tiles with large tiles and go for light hues, such as pastels, cream or white. This idea will also work with smaller bathrooms. The large tiles and the light colors can make a small room to appear larger. If you want to add sophistication to your modern bathroom, why don’t you install some vanity mirrors in it? Using vanity mirrors can help to induce a sense of deep relaxation and comfort in your bathroom and at the same time, it helps to visually enlarge the area. There are lots of vanity mirrors that you can buy these days. You can even choose to have a custom made mirror to be installed near your bathroom sink. Who says chandeliers are only for the living room? You can definitely install chandeliers anywhere you want to. So when it comes to bathroom remodeling, why don’t you install one of those elegant chandeliers in your bathroom? 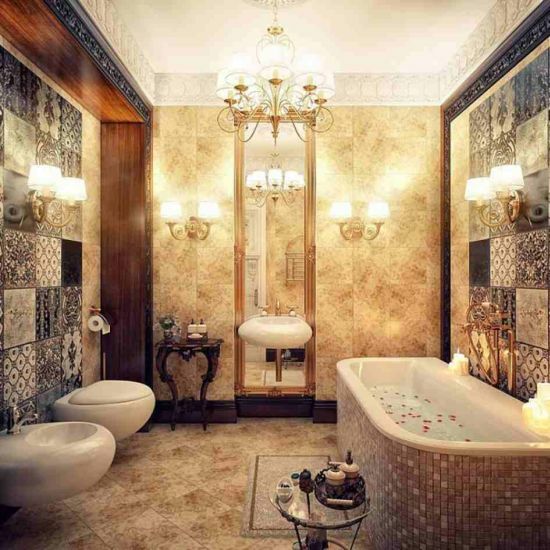 They will not only make your bathroom to look sophisticated, but they also provide adequate lighting to your bathroom and set a romantic mood. A vessel sink is definitely a modern way of remodeling a bathroom. Just take inspiration from the stunning glass vessel bathroom sink shown below. 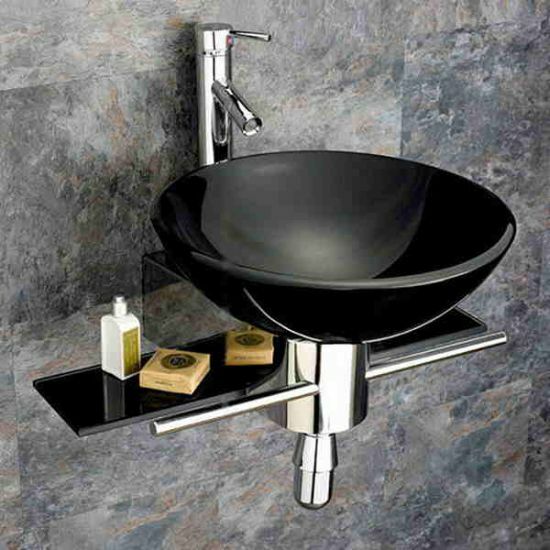 Its combination of steel and black perfectly complements with the contemporary design of your bathroom. You can choose to add some colors to it to beautifully contrast with the black vessel sink but make sure to keep the rest of the furnishings in neutral colors to maintain its modern vibe. If you want to add a touch of elegance and sophistication to your bathroom, then install some sparkling tiles on your bathroom wall or perhaps, on the shower, just like the one shown below. You can choose the color and the patterns that you want, just make sure that it matches well with the overall design of your contemporary inspired bathroom. For those who want a feminine flair, look for sparkling tiles that have pink shades or those that have bright colors. Modern bathroom would of course, require contemporary or modern bathroom fixtures. 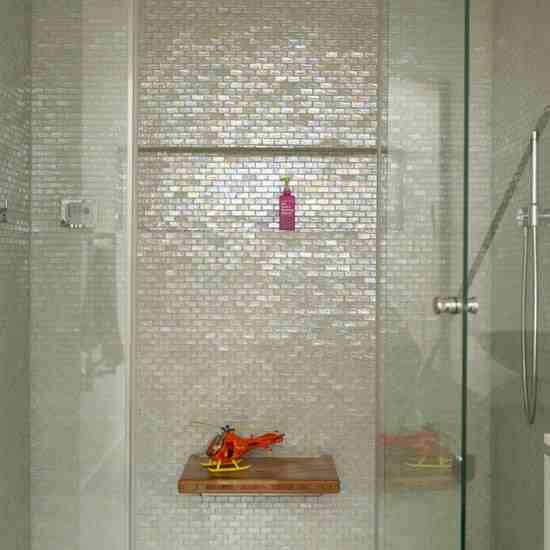 So when it comes to bathroom remodeling, consider installing contemporary showers in your bath. Do not go for just the usual style of showers. Instead go for those with unique style. You may also choose to install two showers next to each other such as the one shown below. Again, modern bathroom will require modern bathroom fixtures. There are lots of unique contemporary bathroom fixtures and accessories that you can buy these days, so invest in these if you want to make your bathroom look modern. A good example is this very creative faucet. It is definitely not like the usual faucet that you often see in hotels, malls, etc. 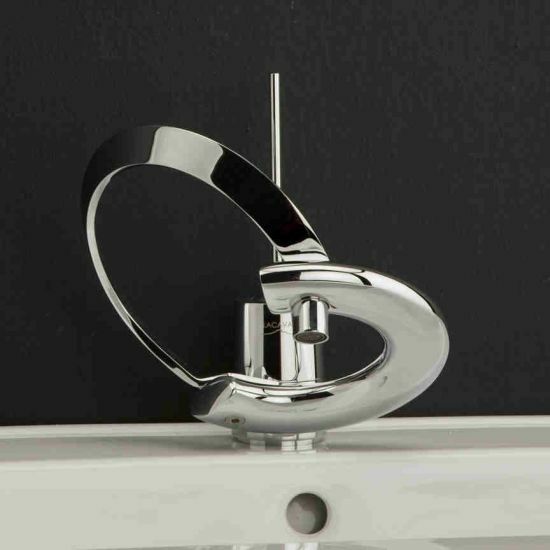 It’s definitely unique and it is perfect for your modern designed bathroom. 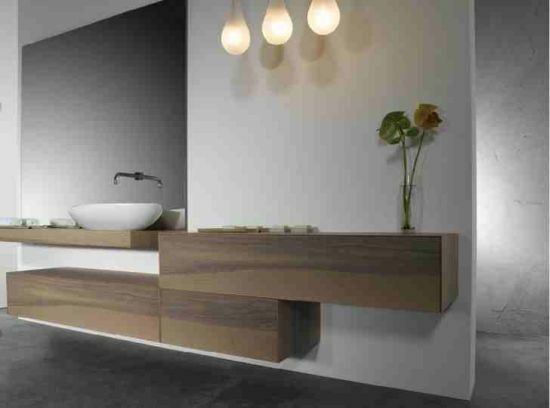 Another great bathroom remodel idea is these floating shelves and a sink. They look very modern, especially if you combine it with a good lighting such as the one shown below. You can use different materials for the shelves and sink, but if you prefer to have a rustic feel in your bath, then go for the wooden shelves and sink. So as you can see, remodeling a bathroom is not really that hard for as long as you have an idea in mind on what look you want to achieve for your bathroom. It might require a lot of time and money, but when you are done with the project, you will realize that all the time and money that you have invested is definitely worth it. Oh my god, what an amazing job! I am really happy to see you blog and these all are looking fabulous. Now, I am confused which design will be the best for my bathroom because all are looking great. I really like massive mirrors, number two. I like being able to look at my entire self when I look into them. Also, putting mirrors everywhere would be cool too. Being able to see myself no matter where I look. My family is always looking at ways to remodel our house. I like the wood and brown remodel because it is modern, yet has a rustic feel. Something like that would help us to add some value and uniqueness to our house. Thanks for the post! Awesome Post! Seriously. I am gonna redo my bathroom and i really did found some great things to consider. One of the thing i am planning to do is to invest in Vanity Mirrors. I think the “spacious and modern” one is my favorite out of this list. I wonder how much that would cost in a remodel! That one is getting pinned to my Pinterest board for our upcoming bathroom reconfiguration. I love the contemporary bathroom remodeling ideas you list! 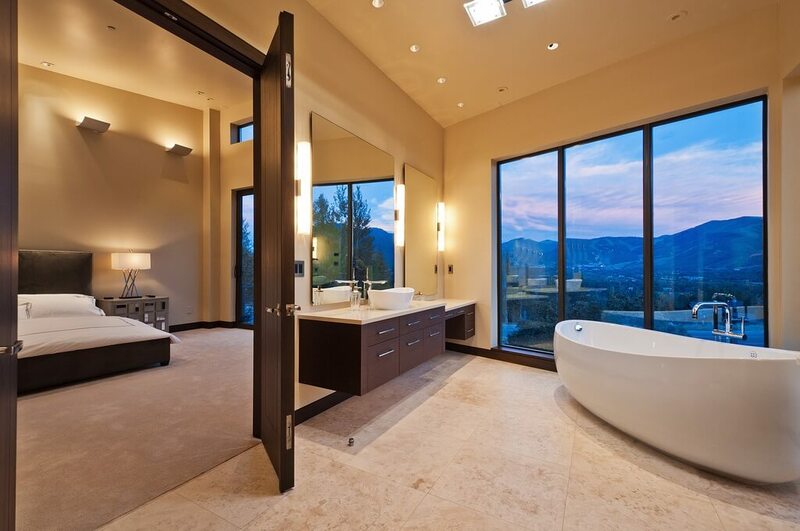 The spacious and modern example you have will be my inspiration for my new bathroom. I’m definitely going to try your tip to use the big mirrors, as I don’t know if it will be possible to get a huge window in my space. Thanks for your tips, they’re all great. Wow!! lovely @Carolyn! You have mentioned great information above…one of the point I like most is #2 that is “Huge Mirrors”. 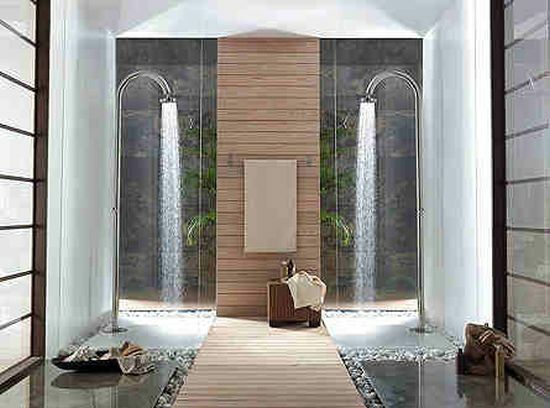 I have like this concept very much..seems me pretty cool..apart from this..Contemporary Showers seems me really elegant and unique…Thanks for Sharing this..I have enjoyed reading all of this…Phenomenal!! I have wanted to remodel our bathroom for a long time. I have never seen the elegant chandelier look before, that would be really cool. You are right, it definitely makes the bathroom look sophisticated. Wow! All of these bathroom remodels look great. Thanks for so many great pointers. The space in #2 looks HUGE because of that mirror!